None but it's a kind of german base headquarter that you need to infiltrate in order to kill Officers. 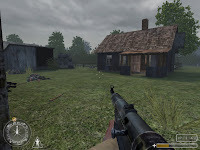 This release was found sleeping on a polish server (found them also at modsonline) and is average in design and quite challenging one according gameplay the author did also two others releases, a bunker one quite short and poor and a more historical one with some additional text that i will try to review when i can get a Polish to English translation of the explanation sheets and the string file. The action is put up in a kind of village occupied but a whole german squadron. The objectif are simple progress (in a linear 'maze' way) kill officers and escape by the back of the headquarter building. Design is correct but not more the environement is too blocky (invisable wall) to oriented you path and ldoesn't let the feeling of something original ( it's obvious that it's just a boxy cube with a limited layout in it. Architecture of building and surrounding elements is also not that bad but make it clear with progression that a lot of copy/paste building was used so that realism decrease with a deja vu progression. It's certainly according the conception average but at least it keep you back on track. 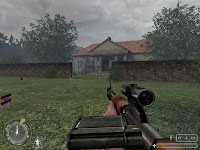 Gameplay is clear since there are only two main objectives and that your way to progress is really canalized by surronding elements (especially invisible walls) but challenging through enemies placement and amount of them will make it, in a lot of spot, a quite challenging experience. In conclusion : this mas is certainly not a perfect release but through it's challenging gameplay and correct general layout i had fun enough playing it to add this one to the ww2 sp map corner.